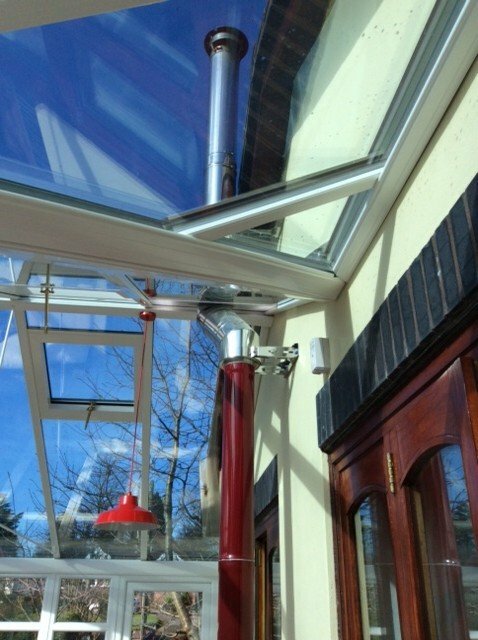 It is a very good idea to fit a wood burning stove in a conservatory. Wood burning stoves and conservatories are a perfect example of synergy in action, the combined result being greater than the sum of the individual parts. Conservatories are often chilly during winter (due to the amount of glass) and may be abandoned by families during the colder months. A wood burning stove converts a cold glass-box into a warm and relaxing space. Using modern clip-together chimney materials the installation of a wood burning stove is often not as difficult or expensive as a householder might think. The easiest place to site the stove is close to the main property so that the flue can be secured to the building and attain enough height so that the cowl gets to “free air” (usually above the guttering or soffit). It might be possible to site the stove away from the house (deeper into the conservatory) but then a building regulation we call the “2.3 metre rule” starts to make live difficult and it is almost certain that the stove will then have to be at least 2.3m away from the main property. 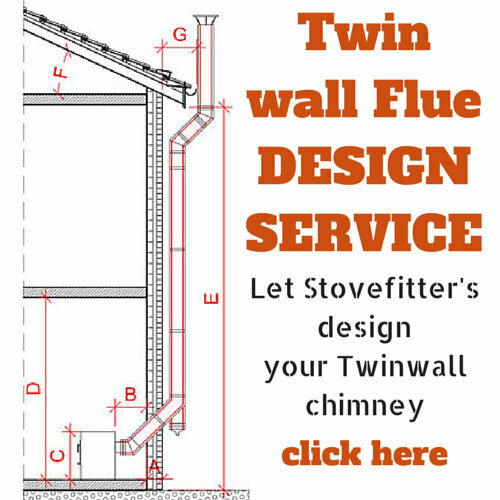 In this situation it may be difficult to support the chimney (min height 3 to 3.5 metres) with suitable bracketry. 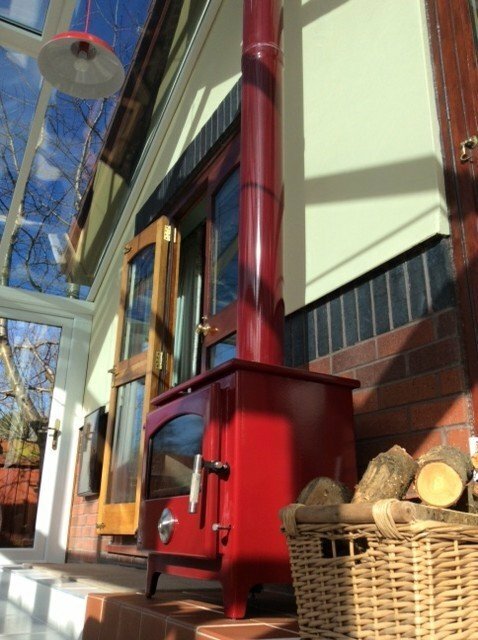 Is having a wood stove in a conservatory a good idea? Yes, yes and yes! Conservatories in particular, but also extensions can be very cold in the winter months and are often neglected for this reason. Add a wood stove and you have a snug space to relax (switch off the central heating in the rest of the house and save some cash and the planet! Stoves, unlike open fires are completely clean – in our own house we have a small wood burner in a snug with off-white walls and furniture with light sheepskin rugs on the floor. What sort of price am I looking at? If doing it yourself then approx. £500-£750 plus the cost of the stove. If paying a registered installer then maybe £1,500-£2,500 plus the cost of the stove. Planning permission almost certainly no for a wood burning stove in a conservatory (unless in a conservation area or on the front of the property). 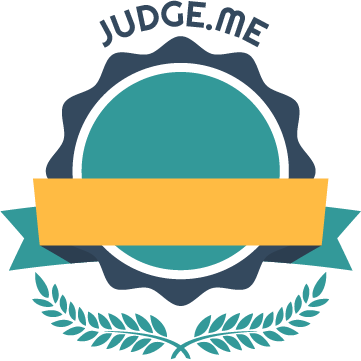 You will need Building Regulation Certification from the local council. See “legally can I fit my own stove?” unless you employ a HETAS registered fitter who can self certify. I am in a smoke control area is this a problem? No. You will need a DEFRA smoke exempt stove if you wish to burn wood though. See “Smoke Control Areas and Wood Burning Stoves”. 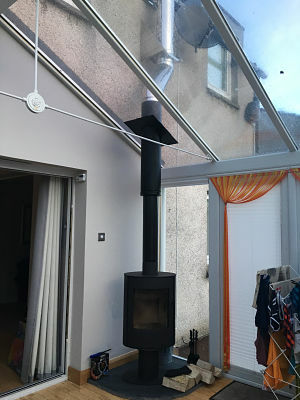 Who should I get to fit my wood burning stove in a conservatory? You can do it yourself as long as you follow the procedures laid down by your local Building Control (at the time of writing you will likely not require and permission if in Scotland see “legally can I fit my own stove?”. Otherwise you can find and employ a registered HETAS installer who can self certify. Can I fit the stove anywhere in the conservatory? 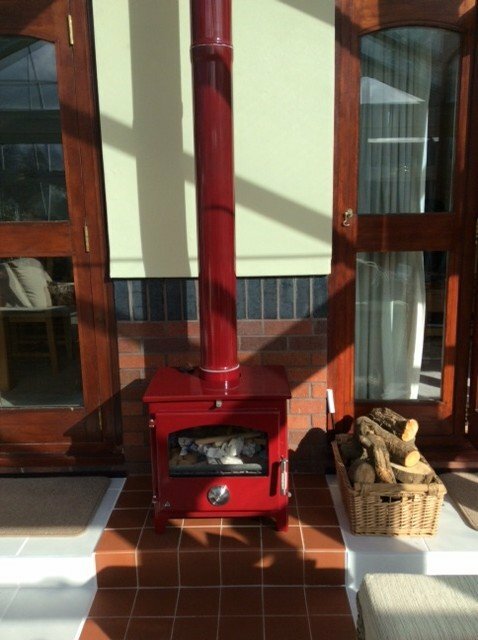 Usually the easiest place to place the wood burning stove in a conservatory is close to the existing house as this provides a strong wall for the chimney to be attached to. 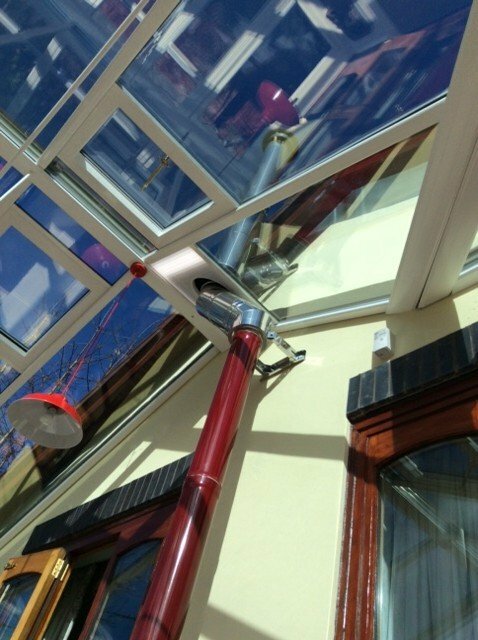 The chimney will travel up the wall, out through the conservatory roof, and past any soffit or guttering to get to clean air. How high above the soffit or guttering? 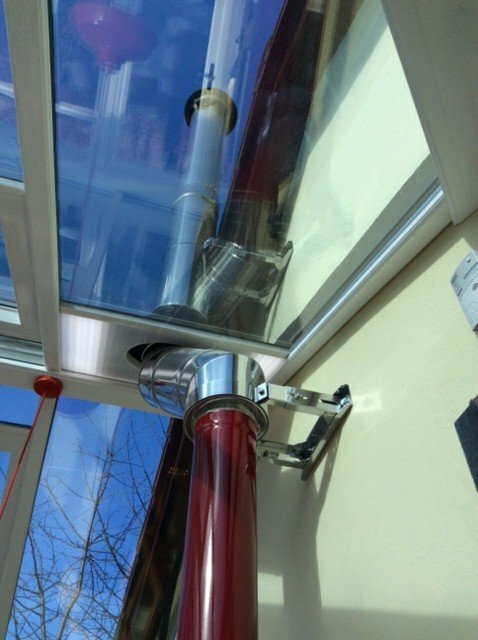 See Chimney regulations as this can be anywhere between 0.6m and 2m (even higher sometimes). The chimney will require some methods of support. With modern chimney materials one can get away with a minimum chimney height of about 3m or 3.5m in height (above the stove). This sort of length really does need some kind of support and attaching brackets to a conservatory is not always easy. It can be possible though. So looking at 1 and 2 above it is apparent that a stove will generally be against the wall of the house OR be at least 2.3m away from the property (which might be tricky). 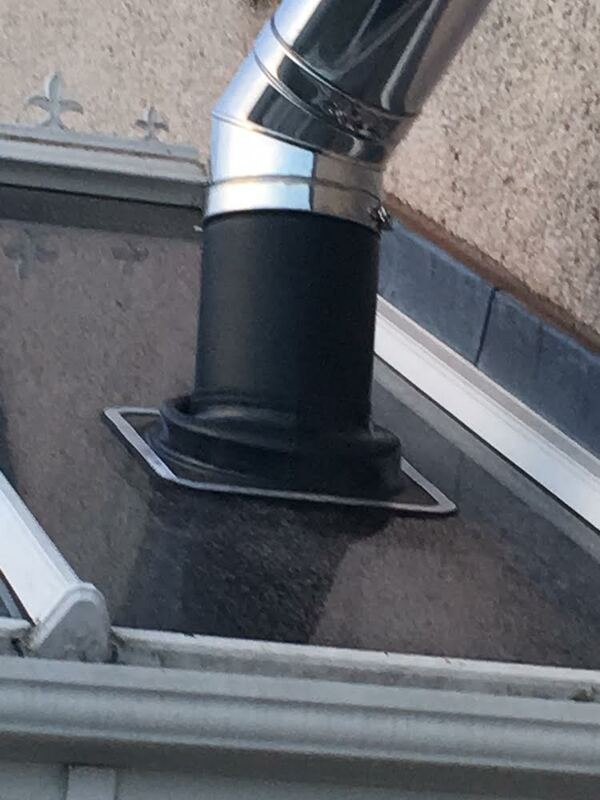 How do I seal where the flue passes through the roof? 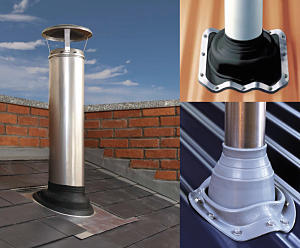 The top right EDPM flashing has a metal flange that can be bent to fit many different surfaces with the seal being created by the “rubber” material being tightly trapped between the flange and the roof surface. A Silicone sealant is also used between the roof and the flashing for “belt and braces” waterproofing. The screws are self tapping “roofing screws. But what if one is passing through glass? What do do then? Easiest method is to get your conservatory company to add a non-glass panel for you. Go talk to them. In our top picture our customer actually had the glass installed with a neatly cut hole in the glass. He then used the EDPM flashing and secured it in place using Dow Corning 791 High Modulus Silicon (using a plywood template and weights to hold the flashing to the glass whilst the Silicone set hard).